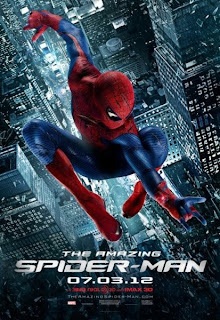 Marc Webb's The Amazing Spider-Man would be a decent movie if it had nothing to do with comic books. When left to his own devices, Andrew Garfield gives Peter Parker an agreeably sardonic side, at once cocky and anxious as he spits out the quips sorely missing from Sam Raimi's post-9/11-tinged idealism. Garfield even enjoys ample chemistry with his leading lady, Emma Stone, which is a nice change of pace, not merely from Raimi's films but the superhero genre as a whole. Were the film nothing more than a slightly surreal abstraction of pimply and emotional hormone changes, it would make a fine romantic comedy powered by believable actors doing above-average work. But this is a Spider-Man film, and the hormonal abstract in question concerns Parker's superpowers, which themselves entail a narrative arc of responsibility that generates the greatest tension of Parker's life. A good Spider-Man story is less about the fight between Spidey and the chosen villain than how his constant quest for a normal, happy life must be sacrificed for the greater civic good. That tension is wholly lacking in Webb's version, which recalls Green Lantern in its cynical rewrite of a noble character into a self-absorbed narcissist who always makes sure to hedge his bets on even the most tentative of mature actions so he ultimately emerges the same erratic jackass at the end of the film he was at the top. Based more off the Ultimate alternate universe of the Spider-Man comic book realm, Webb's film starts with a child Peter watching his secretive parents disappear one evening, stopping their flight just long enough to dump the boy on his Uncle Ben (Martin Sheen) and Aunt May (Sally Field). Years later, the teenaged Peter happens upon his father's old briefcase and discovers a file of advanced scientific calculations and clues. This should be mysterious, but everyone knows that all roads lead to radioactive, bioengineered spiders. This aspect of the story simply treads water until Peter can finally meet his father's research partner, Curt Connors (Rhys Ifans), get himself bit by a lab animal and lose his uncle. Like all origin stories for wildly popular franchises, and especially for reboots of those franchises, the film's plot is perfunctory and telegraphed. We already know how the hero came to be, and we also know that he will not suffer too heavy a blow until at least the second movie. But despite using a different set of Spider-Man comics as a reference point, Webb adds practically nothing to the material, and he subtracts quite a bit. Sheen is, as always, delightfully affable as Uncle Ben, both a stern parental figure and a trustworthy confidant. But he, like Field, is shoehorned into a movie that has no use for him other to move the plot, and his death therefore lacks any weight or meaning. That Peter so utterly ignores his uncle's most critical advice, even at the end of the movie, only makes Ben more extraneous. The only time the film truly works is in Peter's relationship with Gwen Stacy (Emma Stone). One of the first things the audience sees Peter do is take stalker photos of Gwen, yet Stone and Garfield share such a casual chemistry between them that the film incredibly overcomes its intensely uncomfortable establishment of Peter's attraction. Stone makes the most of an underwritten part, her smoky voice and unbendable resolve giving strength to a character who would otherwise have none. Even later, when Parker is battling his first super-foe, Gwen gets to perform some brave feats of her own that make the dynamic between her and Peter more equal than Mary Jane's perpetual damsel status. Best of all is the interim between the overtures of their relationship and the true emergence of Spider-Man as a costumed hero. The period where Peter has acquired his powers but does not yet know how to use them and must learn his way around fighting thugs and an even more awkward school life is stretched into a significant chunk of the film, and for good reason. It is here that both Webb and Garfield hit their stride, Webb toying with minor action that he films with vivaciousness, while Garfield gets the chance to actually stretch out the giddiness of a hero discovering his new gifts. Such scenes are always bypassed as quickly as possible in most superhero movies, so to spend some time actually letting the lead sink his toes into the protagonist's upended world is a welcome change. Even if there is a scene where Peter uses his new strength to dunk on the school bully. Sadly, this spark of originality and competence is all too fleeting compared to the rest of the film and its banal conflict between Spider-Man and The Lizard, created when Dr. Connors' attempt to regrow his amputated arm through transgenesis has unforeseen side effects. The choreography of their fights is amazing, with Parker's "Spidey Senses" informing a quick-response fighting style that stresses an agility and variation of technique. But Webb, who operates far more in his element with the intimate, playful scenes, is not well-versed in action, and he obscures the Lizard's overpowering attacks and Spider-Man's lightning-fast redirects with frantic editing and an awkward, close-up style that rarely lets the camera take in the entire situation. Had Webb allowed the audience to see what was happening in these duels, he would be responsible for some of the most thrilling action sequences in comic book film. As it is, so much of the spectacle of this blockbuster never rises above its considerable potential. But then, a blockbuster does not appear to be what Webb set out to make. He deserves credit for taking what is normally just another part of the hero's montage of self-discovery, the grasp of one's powers and how to control them, and making it the emotional and narrative crux of the film. But that moment of insight into what makes an origin story worth telling—the emotional, not narrative, foundation—does not carry over to the rest of the film, thanks to a protagonist so half-written one cannot even tell whether he is a gifted nerd or merely a moping, skateboarding loner. This unclear setup and motivation makes The Amazing Spider-Man feel especially unnecessary. That's almost an impressive feat among the already stale crop of superhero films that prop up every summer at the box office these days. A shame to hear that it's "not quite there". Still sounds worth a watch though, but I think I'll wait for the Blu Ray release; movie ticket prices are too expensive! I liked the writing. It told me how it fit in to the rest of the comic book/ movie world. Thanks for the tips.